The Annandale Hose Company No. 1 solicits for donations by direct mail only once a year. In addition, we now accept your donations via our new web site. We need you and you need us! Our highly trained volunteers are available to you around the clock and we need your help, so please donate whatever you feel you can afford. 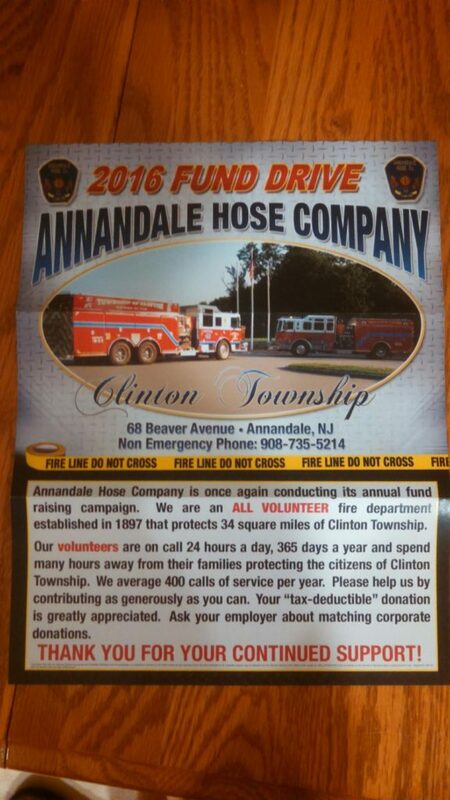 Any donations will benefit Annandale Hose Company and its volunteers. We are proud that so many citizens are willing to volunteer their time to provide protection to the residents of Clinton Township. The 50 men and women of the Annandale Hoe Company No. 1 responded to over 300 alarms, participated in hundreds of hours of training and donated thousands of hours of service during last year. Please help us by making your tax deductible donation when you receive your donation letter, or make a one time gift via our website.Your generosity will insure we fulfill our commitment to you, your family and guests.